The Seahawks fell behind 31-0, staged a remarkable rally in the second half, but ran out of time and lost to the Carolina Panthers in Sunday’s NFC divisional playoff game. Pete Carroll has always maintained that games are not won in the first quarter, the second or the third. Left unsaid is that they can be lost after only six snaps, as was the case Sunday when the Seahawks fell behind 14-0 in the first four minutes on a series of improbabilities. By halftime, Carolina led 31-0 and appeared on its way to a dismemberment. The Seahawks pulled themselves out of a stupor with 24 second-half points. But they ran out of clock, exiting the postseason with a 31-24 loss at Bank of America Stadium (box). Given the start, it might have been more merciful if Blair Walsh last week had made that 27-yard field goal in Minnesota, rather than missing and sending off the Seahawks to Carolina. Carolina’s defensive line overwhelmed QB Russell Wilson for 30 minutes, forcing him into two interceptions, including a rare pick six. Simultaneously, the Seahawks’ defense, which entered as the No. 1 unit in the NFL, played in a dither as everything worked that QB Cam Newton and the Panthers attempted. Seattle raged back after intermission.Wilson tossed touchdown passes of 13 yards to Jermaine Kearse, 33 to Tyler Lockett and then located Kearse in the back of the end zone with a playground-style, three-yard scoring play with six minutes left. But Carolina continued to pick up third downs (8 of 15 for the game), denying Seattle an opportunity to post the second-largest successful comeback in playoff history (Buffalo rallied for a 32-point comeback win over Houston in 1993). Seattle’s Super Bowl window slammed shut in the divisional round with the first six snaps: #1 (Carolina) — RB Jonathan Stewart burst 59 yards to the Seattle 16; #2 (Carolina) — RB Artis Payne 2-yard run, fumble, recovered at the Seattle 8; #3 (Carolina) — Cam Newton 4-yard run to Seattle 4; #4 (Carolina) — Stewart 4-yard TD run; #5 (Seattle) — RB Marshawn Lynch loss of 3 yards; #6 (Seattle)– Wilson pass intercepted by LB Luke Kuechly, returned for a TD and a 14-0 Carolina lead. Only 4:38 had elapsed. After Carolina took a 14-0 lead, the Panthers tacked on a second Stewart TD run (one yard), a Graham Cano 48-yard field goal and a 19-yard TD pass from Newton to TE Greg Olson for a 31-0 lead, Seattle’s largest halftime deficit since the 2011 season. Seattle held the Panthers scoreless in the second half, but the hole was too deep, so they sent Carolina to Sunday’s NFC Championship against the Arizona Cardinals. Assailed and ineffective early, Wilson came back to finish with 366 yards and a 91.1 passer rating, averaging 7.6 yards per play. He completed 31 of 48 (most attempts of his career), but was sacked five times as Seattle’s O-line reverted to early season form. Wilson also led the Seahawks with 32 rushing yards. Wilson’s first-quarter pick six was only the second of his career, regular season or playoffs, and his first since 2012 — also against the Panthers at Bank of America Stadium (Captain Munnerlyn). Marshawn Lynch, who may have appeared in his final game for Seattle, returned after a nine-game injury absence, but never was a factor. The Panthers slammed him for a three-yard loss on his first carry. He finished with 20 yards on six carries as the Seahawks were forced to abandon their running game after falling so far behind. Seattle’s three primary receivers — Kearse, Baldwin and Lockett — came up big. Kearse caught 11 passes for 110 yards, Baldwin eight for 82 and Lockett three for 75, including the 33-yard touchdown on a looping throw from Wilson in the far right corner of the end zone. TE Luke Willson, who missed two games while undergoing concussion protocol, had four catches for 54. Lockett added 100 yards on kickoff and punt returns. His 50-yard kickoff return to start the second half set up the first touchdown. 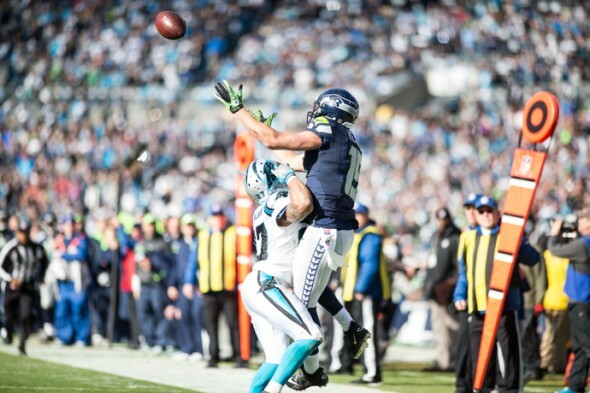 Despite falling in a 31-0 hole, the Seahawks wound up with more total yards than the Panthers, 403 to 295. But they had only 12 rushing attempts, hardly characteristic of the way they usually play. The Seahawks held Newton to 161 passing yards, but recorded only one sack, and were bulldozed by the running game. Stewart finished with 106 yards after his 59-yard scamper (longest against Seattle this season). The Panthers totaled 144. Seattle had not allowed a 100-yard rusher in a franchise-record 27 consecutive games. Stewart also became the first running back on the road to score a rushing TD against Seatt since Jamaal Charles of Kansas City midway through last year. LB K.J. Wright led the Seahawks with 14 tackles (six solo) and LB Bobby Wagner added 13 (seven solo). Rookie ST Frank Clark registered the only sack. “I was very proud of the way we came back. Early this season, a long time, ago, we were 2-4 and came back when it looked like we were dead. But we came back. So I had no doubt we would come back today” — Carroll. “Russell was phenomenal in the second half. I don’t think you can ask much more than that. He was right on point. In the first half, he lost track of Kuechly (the pick six). He just missed that one. On the other one (interception) he got hit. But none of us are surprised at what he did in the second half. We have been an extraordinarily good finishing team. We just ran out of time” — Carroll. “We dug ourselves in a hole and we ran out of time. But our guys never quit. This whole season has been an uphill battle. I’ve never played with a group that had so much heart. Now we just have to refocus, work hard in the off-season and get our minds right” — Kearse. “When we sit back and look at this, there are no moral victories. I got to tip my hat to the Carolina Panthers. They came out and played a great game” — Baldwin. “This is going to stick with us until we play again next year. But we’ll be back and ready to go. We just came up short. I’m going to come back a lot better” — Lockett. “The second half was really excruciating to watch. It really was a tale of two halves. But we had a great plan coming in and we just have to learn from this and keep putting it together” — Newton. Sunday’s game was only the second of Wilson’s career that the Seahawks did not have a lead at some point (also St. Louis three weeks ago) . . . Wilson is 7-3 in playoff starts (the most wins in a player’s first four seasons) and Carroll 8-4 since he became head coach in 2010 . . . Kearse has six postseason touchdown catches, a franchise record . . . The Seahawks are 9-7 in their past 16 10 a.m. starts . . . The Seahawks are 3-10 all-time in road playoff games . . . Seattle had won a franchise-record six consecutive road games, including playoffs, before Sunday . . . Both LT Russell Okung and DE Cliff Avril were forced out of the game with injuries of undetermined severity. It’s really sad to know the Patriots are most likely going back to the Superbowl while the Hawks go down in flames. Last year’s last second loss stings more this year now. Hopefully they can strike gold in the draft & find ways to improve that awful offensive line, which hasn’t been this bad since Rick Mirer’s rookie year. Also they need to cut ties from Lynch & move on from his ridiculous circus show antics. 1❝my neighbor’s mate is getting 98$. HOURLY on the internet❞…. Your comments about Lynch demonstrate a serious lack of grasp. Yes, ML may well have played his last game for the Hawks–but that wouldn’t be due to “ridiculous circus show antics”. Simply age and cost. For a running back, especially one who runs through and over people, he’s getting old. In case you haven’t noticed, this “run first” philosophy is going by the wayside. There was ONE RB in the playoffs with 1000 rushing yards. The Seahawks are in transition & hopefully can do so quickly/effectively. With the league no longer emphasizing the ground game, Lynch & his distractions/general aloofness need to go. The problem with having a garage sale offensive line is that when great pressure is applied, sometimes the masking tape rips. Good column Steve. The team will not look the same next year so it’s time to focus on the draft and trades. The UFA’s are many and will be prized by other teams. The way to free up salary cap and get a few draft choices/players in a trade are to trade Graham, Okung and Lynch, each paid a lot and able to be replaced: Willson, including his blocking and great hands, is almost the size of Graham ($9M) and just as fast. Lynch has another year left but not at $11.5M, so he can be traded. Oft-injured Okung ($7.2) can be replaced via trade. So, that gives us $27.2 M AND players on trade/the draft. We showed after Graham left he wasn’t much of an add, if any, once Willson came back. Rawls made us forget Lynch. We can’t trade Okung, he is a free agent once the league season ends and another team is going to pay him more than the Seahawks can/will. Irvin will be gone too, hopefully Clark will be ready to take his place next year. We will have to wait and see on Kearse but if we can get Richardson and Lockett on the field at the same time with Baldwin and Graham, the passing game will improve even more I think. I believe John & Pete figured out this year that they do need to invest in O-Linemen that actually played O-Line in college in the earlier rounds of the draft. O-Line and D-Line are the main needs in this draft. Lynch has been great bit also becoming a bit of a distraction and I think it is time to let him go sadly.